In 1960, NASA put its first "Earth-observing environmental satellite" into orbit, and, ever since, these satellites have let us observe the dynamics of our planet in a new way. They can tell us all about changing weather patterns, the impact of climate change, what's happening in the oceans, the coastlines, rivers and more. The satellites have also demonstrated again and again the Earth’s aesthetic beauty, revealed in the patterns, shapes, colors, and textures seen from space. 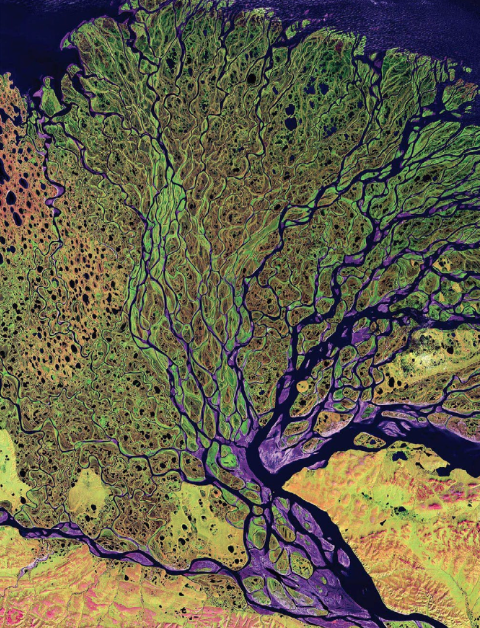 That beauty is what gets celebrated in NASA Earth As Art, a new visual publication made available as a Free 160-Page eBook (PDF) and a Free iPad App. Featuring 75 images in total, the app gives you a very aerial look at places like the Himalayas, Arizona’s Painted Desert, the Lena River Delta in Russia (shown above), the Byrd Glacier in Antarctica, and much more. Enjoy the images, from the surreal to the sublime. self is regular viewer of the site. which is helpful to enrich my knowledge on defarant spare. specially about studying movie,arts & other related fields. thanks for providing wide knowledge range.